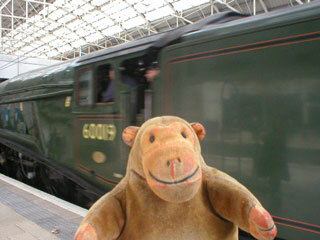 Mr Monkey found out that, for the first time in many years, a steam locomotive was going to pull a train into Manchester Piccadilly station. He thought he ought to be there to see it. 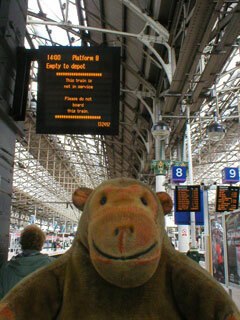 On Saturday March 27th, Mr Monkey caught a train into Piccadilly. He went to the information desk to check which platform the steam train was arriving on, then scampered along to platform 8 where the departure board warned him not board the next train to arrive. 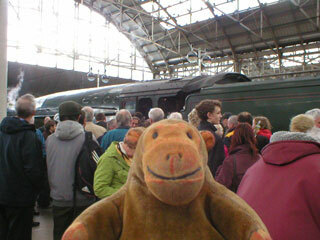 Mr Monkey trotted almost to the end of the platform - he didn't go to the very end because of the number of people with cameras who were already there - and after a few minutes the train arrived. 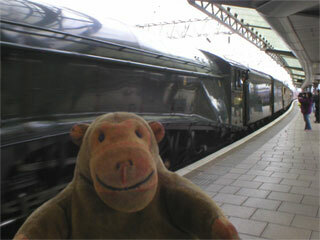 Mr Monkey admired the sleek streamlining of 60019 Bittern as it rolled past him. He noticed that it had two tenders, the first full of coal and water, the second just holding water enabling the locomotive to travel all the way from London Euston without stopping to take on more water. This was lucky, as there probably isn't anywhere to stop for water anymore. Bittern is an A4 Pacific 4-6-2 designed by Sir Nigel Gresley for the London & North Eastern Railway. Thirty five of the class were built, the most famous being Mallard which holds the world speed record for a steam locomotive. Obviously the Bittern wasn't going at all fast as it came into Piccadilly. When the train stopped, Mr Monkey, the people who'd been waiting on the platform, the passengers from the train, and a fair number of people who'd just been waiting for ordinary trains gathered around the locomotive in admiration. 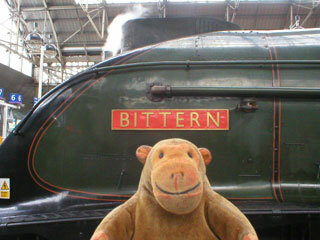 Mr Monkey found that most people stayed clear of the end of the platform where Bittern was leaking steam. 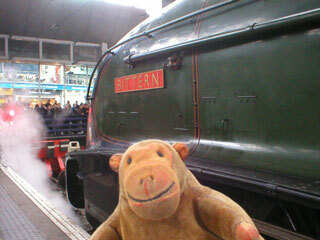 Everybody had to pose with the nameplate of Bittern, so Mr Monkey did too. 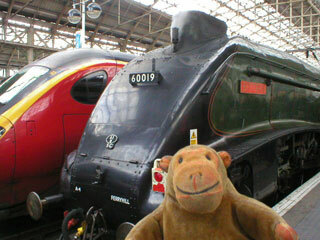 Mr Monkey noticed how closely the shape of Bittern, designed in 1935, matched the shape of the Pendolino, designed in 2001, beside it. 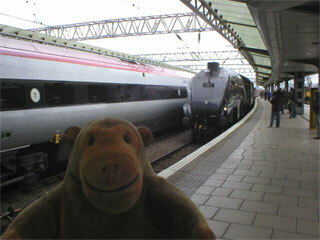 You can open the front of an A4 to get at the boiler; Mr Monkey is pretty sure you can't do that with a Pendolino. After half an hour Bittern reversed out of the station, but by that time Mr Monkey's humans had insisted on going off for a coffee and he'd had to go with them. Mr Monkey saw Bittern again on the way home, rushing past it as it steamed gently in a siding at Ashburys station, where it was waiting before going via Stalybridge to York. 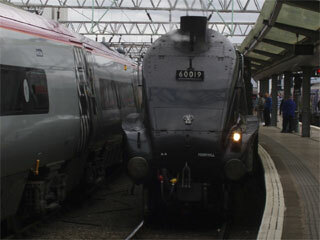 The carriages - and the passengers - were taken back to Euston by a vintage Class 47 diesel engine later in the day. Details of the A4 Pacific locomotive : London & North Eastern Railway Encyclopedia. The organisers of the run : The Railway Touring Company. The Bittern's home : Mid-Hants Railway - The Watercress Line. Videos showing Bittern at various places during the day : YouTube.